Admission is undertaken through CAT/ MAT /XAT/ GMAT/ CMAT score. Admissions of the applicants will be processed through GAT after fulfilling the eligibility criteria. Admissions of the applicants will be processed through GAT/ Personal Interview after fulfilling the eligibility criteria. The candidates should have a valid score in GATE Entrance examination. Admission will be undertaken through GAT/ Personal Interview. Candidates should have a valid score & must have qualified in GATE. The candidate should have a minimum of 50% marks at the 10th standard level and a minimum of 50% aggregate marks in Physics/ Chemistry/ Mathematics at the 12th standard to qualify for admission. The candidates should have passed Graduation from any stream with minimum 50% marks for General category and 45% for SC/ST from a recognized University. For admission to Glocal University, Saharanpur the candidate should have a minimum of 50% marks from any stream with English and Maths as compulsory subjects in the 10th & 12th standards. The candidates should have a minimum 55% marks either in the Bachelor’s Degree or in the Master’s Degree in Sciences/ Social Sciences/ Humanity or Bachelor’s in Engineering/ Technology with specialization in Science and Mathematics with 55% marks or equivalent to qualify for admission. The candidate should have a minimum 50% marks at 10th standard level & minimum 50% aggregate in Physics and Chemistry as compulsory subjects along with Mathematics/ Biology at the 12th standard to be eligible for admission. For admission to Glocal University, Saharanpur the candidate should have a minimum 50% marks at 10th standard & minimum 50% aggregate in Physics/Chemistry and Biology at 12th standard. For admission to Glocal University, Saharanpur the candidate should have passed 10th standard with Science and Mathematics or equivalent. For admission to polytechnic first year, the applicants should clear the qualifying examination with minimum 35% score from a recognized board. The candidate should have passed 12th with Science and Biology/ Mathematics. For admission to Diploma in Pharmacy, the applicants must have cleared qualifying examination from a recognized board. The candidate should have a completed BCA/ B.Tech or AMIE or equivalent in Computer Science & Engineering with minimum 50% marks. For admission to Glocal University, Saharanpur the candidate should have B.Sc (Botany, Zoology, and Chemistry) or B.Sc (Microbiology /Medical Microbiology/ Biotechnology / Genetics / Industrial Microbiology) or B.Sc MLT/MM with a minimum of 45% marks. The candidate should have B.Sc (Botany, Zoology, and Chemistry) or B.Sc (Microbiology /Medical Microbiology/ Biotechnology / Genetics / Industrial Microbiology) or B.Sc MLT/MM with a minimum of 45% marks. 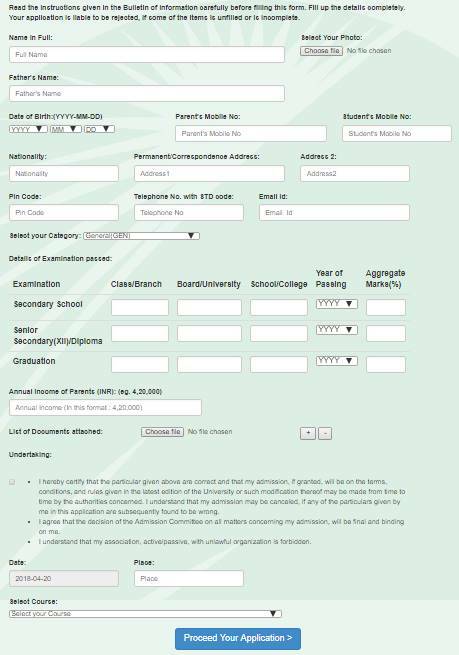 The candidate should have B.Sc (Botany, Zoology, and Chemistry) or B.Sc. (Microbiology / Biotechnology / Genetics / Industrial Microbiology) or related subjects with a minimum of 45% marks. The candidate should have B.Sc (Botany, Zoology, and Chemistry) or B.Sc (Microbiology / Biotechnology / Genetics / Industrial Microbiology) or related subjects with a minimum of 45% marks. The candidate should have B.Sc (Microbiology /Medical Microbiology/ Biotechnology) or B.Sc MLT/ B.Sc in any branch of Life Science with a minimum of 45% marks. The candidate should have completed BE/B.Tech or AMIE or equivalent in the respective branch with minimum 50% marks. For admission to Glocal University, Saharanpur the candidate should have passed 10+2 examination with minimum aggregate marks of 45% for General Category students and 40% for SC/ST students from a recognised board.